The Columbia South Carolina Temple is the 62nd operating temple of The Church of Jesus Christ of Latter-day Saints. One hundred sixty years ago Emmanuel Masters Murphy was the only member in South Carolina, but through his efforts others were converted to Mormon Church. Murphy even visited Joseph Smith during the Prophet's incarceration in Carthage Jail. Because of the Civil War, the migration of the Saints to Utah, and persecution within the state itself, the Mormon Church in South Carolina saw little growth until 1917, when the first branch (small congregation) was organized with 40 members. The next 80 years saw enormous growth, and in 1999 there were 26,000 members in South Carolina. One member, Gwen Slay Llewllyn, remembers when the Church was smaller, before permanent buildings were built. She said, “I was 13 when the stake was organized. My relatives and I would have to clean tobacco out of rented buildings before services could be held.”  Now the Mormon Church not only has over 45 meeting houses in South Carolina but a Mormon temple as well. Before the South Carolina temple was dedicated about 20,000 people walked through it during an open house. President Gordon B. Hinckley presided and gave the dedicatory prayers 15-16 October 1999. 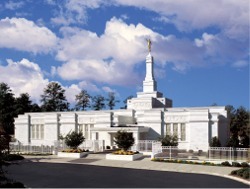 The new Mormon temple is located in Columbia South Carolina, because it is the capital and a central location within the state. The building is set in a residential neighborhood and surrounded by native loblolly pine and oak. The grounds are landscaped with the area's natural flora including myrtle, holly, mums, and dogwood trees. The exterior of the temple is gray granite and features art glass windows. The temple is graced by a traditional single spire topped by a gold-plated angel Moroni. The Columbia South Carolina Temple has a total of 10,700 square feet, two ordinance rooms, and two sealing rooms. “News of the Church,” Ensign, Mar. 1999, 75. This page was last edited on 24 January 2012, at 11:32.